I’m finally sober and coherent enough to start reviewing some of the many beers sampled at this year’s Great British Beer Festival. 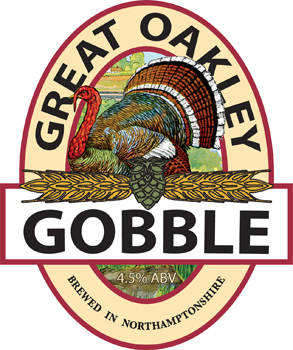 One that I have fond memories of is Gobble from the Great Oakley Brewery in Northamptonshire. Admittedly a lot of the fond memories I have stem from Alan, Ric and I thinking it was hilarious to approach the young lady manning this particular pump and asking her how much she was charging for a gobble…. I think we might have had a few by that point. Off colour wordplay not withstanding I did enjoy my pint of Gobble and it seems like I wasn’t the only one; Gobble won joint bronze in the “Special Bitter” category. When poured Gobble was a lovely golden coloured beer with a weak head, the aroma was light and zesty with a nice hint of caramel creeping in at the back and just seemed to scream summer drinking. In terms of taste Gobble had a nice soft hoppiness coupled with some zingy citrus fruits making for a very refreshing taste, this was offset with a nice hint of caramel sweetness. I noticed a little bit of an oily texture to the beer but considering the hoppiness and the nice citrus sharpness this wasn’t unpleasant and rather seemed to prevent the beer being too dry. All in all a very very good little beer and well deserving of it’s award. Theakston’s Old Peculier is one of the most widely recognised real ales out there, not only that but it is also one of the oldest having been brewed since at least 1890 so it genuinely is an old ale! The eagle eyed amongst you might notice the rather odd spelling of Peculier; well no it isnt a typo or an intentional misspelling it’s a totally different word in and of itself and one just as interesting as the beer it adorns. The word peculier refers to a parish or place of worship that falls directly under the jurisdiction of the crown as opposed to the local diocese. In the case of Old Peculier Theakstons are making reference to the Peculier of Masham in North Yorkshire where the beer is brewed; the town was declared a peculier after the archbishop of York Minster couldn’t be bothered to make the trip north to oversee it’s affairs. When poured the beer is thick and viscous with an opaque dark brown colour and a nice frothy head, exactly what springs to mind if someone were to talk about an old ale. The aroma of the beer is full and hearty, there are rich fruity notes of plum and raisin and a slightly yeasty bready undertone. I have often heard people say that they get a banana like smell off of Old Peculier but I will hand on heart admit to never having noticed it myself, or to at least having not identified it as banana. Before I start on the taste of OP I am going to go ahead and give a little bit of advice, ideally don’t put this into the fridge at all or if you really must chill this beer then leave it to come to room temperature for a while before you dive in. The flavour really does develop better at a slightly warmer temperature and you will find it a far more enjoyable pint. That said let me get on to how it is to drink; it is a good bit thicker then a lot of commercial beers but I find that just reinforces the Old Ale feeling for me. It is a fairly sweet with a nice plummy taste coming through this is perfectly balanced with a good solid bitterness and a nice amount of hoppiness that stops it from ever tasting too rich or cloying, you can also pick up the alcohol, not enough to be unpleasant but just enough to keep things dry and slightly spicy. You can pick up lots of dark maltiness and fruit along with a hint of coffee and molasses, this is truly a complex beer and not something to try out on your unsuspecting guests who have only ever had a mass produced lager before. I have been a big fan of Old Peculier ever since I first tried it many years ago, I think that it is a perfect example of what real ale is all about, flavourful, unique, slightly challenging and yet still incredibly accessible. Innis & Gunn limited edition rum cask oak aged beer, well whatever there is to say about the beer it’s name is a bit of a mouthfull! It is a well known fact that maturing beer in particular barrels will impart a particular flavour to the beer, hence we have whiskey cask aged beers, oak aged beers etc. 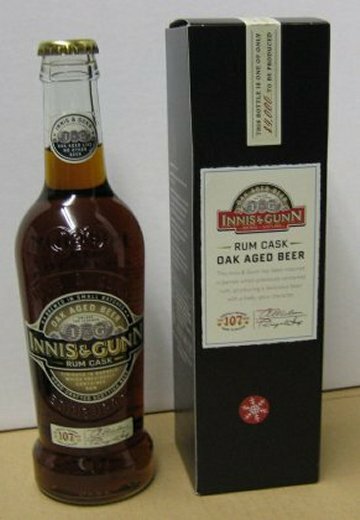 In this particular instance Innis and Gunn have given this beer a 60 day maturation period in oak, half of that in American Oak barrels and the remainder in barrels which previously held navy rum. After this initial maturation the beer was left for a further 47 days for the flavours to mellow and blend together. Now off the top of my head I would be expecting anything that has been oak aged and has absorbed some rum like flavours to have a fruity sweetness and a rich smokiness from the oak, maybe some tobacco notes. Now normally I try very hard not to pre-judge a beer but the combination of a 7.4% a.b.v and what I would imagine to be an awful lot of sweetness didn’t fill me with much confidence that this is a beer I would wish to do anything much with other than sample…. lets find out if I was right! The aroma when you open the bottle is quite pleasant there are notes of rum, raisins and vanilla with a slight spicy maltiness in the background. If I had to make one over-riding observation in relation to the aroma of this beer it would have to be that the rum notes are really strong and perhaps a little overwhelming, especially as this is supposed to be a beer, not actual rum. It pours a pleasing amber/ruby colour and is quite clear, the head is rather thin but lasts reasonably well. You can really taste the rum in this beer, there is a raisiny fruitiness, a hint of vanilla and some smokey spiciness as well, luckily this beer isn’t as tooth rottingly sweet as I had imagined nor as sweet as the aroma had suggested, there is some hoppiness to the beer but it is doing a really good job of hiding behind the sweetness. The body of the beer is very light, particularly in light of the high a.b.v and the big flavours in the beer, to be honest it was a little too light for my personal tastes. I have tried this beer twice now and both times I have thought that there is far too much diacetyl present for my liking. Diacetyl is a by product of the fermentation process that gives a slick mouthfeel if it is present in small amounts and when present in larger amounts gives a buttery flavour to the beer, but not in a nice sense. To give you an idea as to the properties of diacetyl it is what is used to give artificial butter or margarine its “butteriness” – not what I want in my beer. I had been hoping with the second bottle not to get as much of that diacetyl taste coming through as it can sometimes just be the result of an bacterial infection in a particular bottle but alas that was not to be and there it was in all its slippy glory in my second bottle. To sum things up this was an interesting beer to try but far too sweet for the relatively light bod and buttery taste from the diacetyl just doesn’t sit right with me. All in all a dissapointment. So this morning I had a little bit of surprise, I decided to go and visit my favourite little hole in the wall cafe; the food there has always been crap to sum it up politely but they serve tea that looks exactly like wood varnish and is exactly how I like it. The problem is it’s gone, now where am I going to get tea that the spoon can stand up in? The simple answer is I will just have to stop being lazy and bring a flask from home. The silver lining to the closing of this grease encrusted grot hole is that it has been replaced by what is to my knowledge the only BBQ joint in West Cork. It has been opened up by a chap from Arizona by the name of Mike and his Irish wife, he has bought a smoker over from the states with him and is burning applewood that he is obtaining from a local orchard, so far so good. The menu looks pretty appetizing featuring such BBQ staples as baby back ribs, brisket, home made beans, coleslaw and one of my personal favourites pulled pork. Try as hard as I might I couldn’t get Mike to disclose any of his secrets to me, much like those pesky magicians in that sense, but I can vouch for the pulled pork being delicious, so much so that I bought a pound of it to take home and eat later. The problem with 1lb of pulled pork is that there is only 1lb of it and try as I might to ration it out it just doesnt last. The only logical option was to crack out MY recipe for homemade pulled pork and hit the kitchen. As I don’t possess a smoker of my owner and the weather in Ireland isn’t often the best for having the BBQ out I have devised a different but equally tasty method for preparing my pulled pork. For this recipe I get roughly 4 kg of pork collar from my local butcher, I get the skin left on and the bone left in and trim everything up at home, if you don’t have the time and inclination ask the butcher to do this for you and just make sure that you remove any tendon/gristle that is left when you get home. Mix the brown sugar together with enough sea salt, black pepper and paprika to give the meat a good rub, pop it in a bowl, cover with clingfilm and leave in the fridge for at least an hour ideally longer. De-seed the bell peppers and cut into thin strips, you can use green bell peppers if that is all you have to hand but red or yellow work best and look better in the finished dish. Peel the red onions and chop into quarters, if the onions are particularly large then you can chop them into eighths. Take your slow cooker and put roughly half of the chopped peppers and onions on the base of the pot, now place the pork on top and add the remaining peppers and onions around the sides. Add your garlic, chilli and lemon zest and try to make sure that it doesnt all end up in one clump. Now pour over your bbq sauce; which bbq sauce you use really is down to you and your personal tastes. I normally use a mixture of half a bottle of Levi Roots Reggae Reggae sauce for its rich fruity flavour and warming scotch bonnet kick and half a bottle of something with a bit of a smokey taste to it. Top the pot up with warm water until the pork is covered, pop on the lid and set the slow cooker onto it’s lowest setting. If you aren’t using a slow cooker then I would pop everything into a mid size casserole dish and set it in the oven at about 100c. At this point you can just forget all about it for a good long while, I tend to leave mine in the slow cooker for about 12 / 13 hours if I can but you can get away with less time. I certainly wouldn’t leave it for anything less then 6/7 hours though as you want the meat to be really succulent and juicy. When you are ready to eat take the pork out of the slow cooker and grab yourself a couple of forks, the meat should be so tender that it just shreds up without any effort whatsoever. 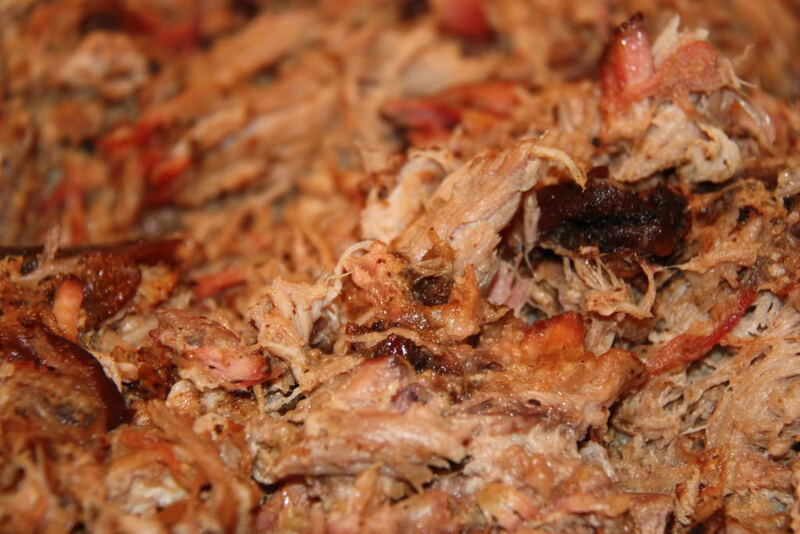 Pile the pulled pork onto a platter, add the onions and peppers from the pot and pour over a ladle full of the cooking liquid to help keep everything nice and moist. Serve with nice fresh rolls or flatbreads, a nice crunchy coleslaw and bbq sauce of your choice to finish it all off nicely. A fair bit to report from my ongoing home brewing saga so far. My second batch of beer has now been bottled, well about 6 days ago! So I am eagerly awaiting my first little taste in order to see how my IPA has turned out and whether playing with the choice of fermentables has backfired or not. Meanwhile my lager is now into it’s third week since being bottled. My brother and I cracked a bottle open on Saturday evening and I think we were both quite pleasantly surprised at how it is coming along. There is plenty of carbonation in the beer and it is developing a really good looking head, it is a little cloudy but that that will hopefully clear further and should definitely start to lessen when the lager is chucked in the fridge. The taste is really rather good if I do say so myself, there is a nice bitterness to the beer and a pleasant slight sweetness coupled with a nice hint of maltiness. It isn’t dissimilar to something like an Erdinger in actual fact. I will be honest enough to say that it has turned out better than I had hoped. This past week I have been desperate to eat Pita Gyros like I used to be able to get back home; unfortunately here in Ireland there aren’t many outlets catering to a man with a craving for good Greek food. So of course I made my own. Sieve the flour into a large mixing bowl and add the salt, at this point give it a very quick mix together with your hand in order to make sure the salt is distributed throughout the flour. Mix the ingredients together until there you have a slightly sticking dough formed, flour a clean work surface and knead the dough until it is smooth and slightly elastic – about 5 minutes or so. Pop your dough onto the counter top, cover with the up turned mixing bowl and leave for at least 15 minutes or until you are ready to cook and eat the bread. roll your chunks of dough into little balls and then roll flat using a floured rolling pin, you should end up with a nice thin bread about 2/3 mm thick. Dust a little flour onto each piece of bread to stop them sticking and stack them up ready to cook. Take a large non stick frying pan/skillet and put it onto a high heat until it is smoking. Once you have reached this point place your flat bread into the pan without any sort of liquid. You will need to cook the bread until the edges start to lift and you start to see nice brown spots on the side that is touching the pan. Once this side is cooked flip the bread and cook the reverse side for about 30/40 seconds. In total you will probably be cooking each piece of flat bread for about 3 minutes. Keep the flatbreads warm whilst you are cooking by wrapping them in a tea-towel or popping them in the oven at a low heat.